Record-Breaking Jackpot Alert! 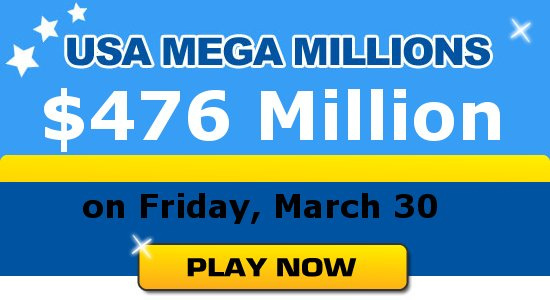 The Mega Millions jackpot for Friday, March 30 has reached an astronomical USD 476,000,000! This is your chance to win the biggest lottery jackpot in history. The lump-sum cash option of Friday's jackpot is $341.4 million — an increase of $81.6 million from Tuesday. Tuesday's Mega Millions draw yielded no winner, and the $476 million jackpot for Friday has officially broken the record for the largest lottery jackpot ever offered worldwide!